Spray 12-inch nonstick skillet with cooking spray. If beef roast comes in netting or is tied, do not remove. Sprinkle beef with peppered seasoned salt. Cook beef in skillet over medium-high heat 5 to 6 minutes, turning once, until brown on both sides. Spray 5- to 6-quart slow cooker with cooking spray. Place beef in cooker (if necessary, cut beef in half to fit in cooker). Mix stir-fry sauce, ketchup, vinegar and gingerroot in small bowl; pour over beef. Place beef on platter; cover to keep warm. Add stir-fry vegetables to mixture in cooker. Increase heat setting to High. Cover and cook 15 to 20 minutes or until peppers are tender. Remove netting or strings from beef. Serve pepper mixture with beef. 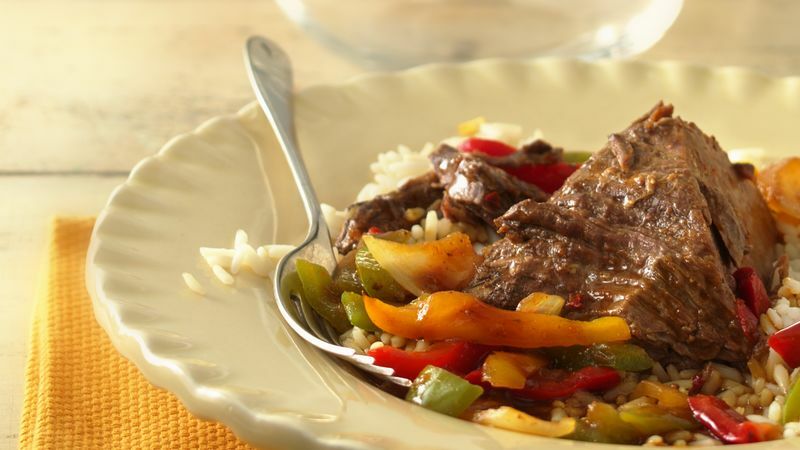 Although it’s tempting, avoid peeking in the slow cooker during cooking. Lifting the lid lets steam escape, and steam helps with the cooking. Browning the meat adds flavor and helps seal in the juices, but if you’re short on time, you can skip this step. Serve this Asian-influenced roast on a bed of hot cooked rice or Asian noodles, along with steamed sugar snap peas.